How long can an OilFresh device last? 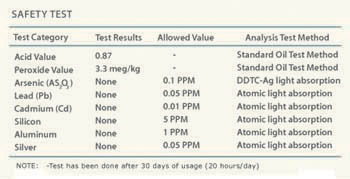 What is the lifespan of OilFresh OF1000 Series device? Depending on given usage conditions and maintenance, it may outlast its 2 year product warranty period. We recommend that the users replace the device with new one before it reaches three years of usage. 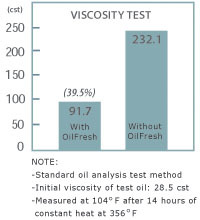 What effects of OilFresh on the viscosity of frying oil? We have observed that OilFresh accelerates frying time. How does it work? Any danger of its leaching in high temperature frying oil while cooking? Absolutely not. The catalytic components are finished by processing through a temperature in excess of 1,000 degrees Celcius. NSF has confirmed that there is no safety issue. 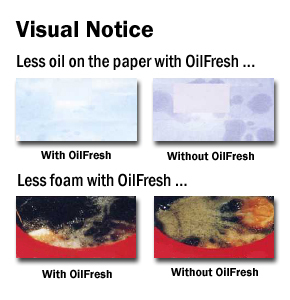 Are there any visually noticeable differences when you use OilFresh? You also can notice much less smoking from the oil over time. What kind of oil does OilFresh work for? OilFresh works for shortening as well as vegetable oils - basically all kinds of frying oils including hydrogenated, partially-hydrogenated and non-hydrogenated oils. We understand Trans Fat is very harmful and should be avoided. How can OilFresh contribute to 'Trans Fat Free' movement? Shortening is the most popular frying oil in foodservice industry due to its good shelf life, or in other words good economy and its taste (close to animal fat). With OilFresh, you can easily migrate to Zero Trans Fat oil solution (non-hydrogenated oil such as genuine vegetable oil) without extra cost burden. Which fryers are compatible with OilFresh device? The current OilFresh OF1000SE and OF1000HC models are compatible with most of commercial open gas fryers made by Pitco, Frymaster, Dean, Henny Penny, Imperial, American Range and many more. OilFresh OF1000SM is designed for most of electric floor standing fryers and also flat bottom fryers models such as Dean 1824G and 2424G, and Frymaster FMG18FBSD etc. OilFresh OF1000SH is designed for Par 2 / Par 3 Ultrafryers as well as for large oil capacity electric floor standing fryers. NOTE: Please contact us for custom device. Yes, the catalytic pellets as well as the device enclosure design itself are all patented in U.S.
Are there any safety issues with the device? Absolutely not. The OilFresh product has been reviewed and authorized by FDA. It is also certified by NSF. Click below to go to the listing site. What to do if we stopped using OilFresh for months and would want to use it again? The OilFresh device should be kept in boiling water for at least two hours before re-use in the fryer. However the efficacy of the device might not be the same as before. There are billions of pores on the ceramic pellets in the device enclosure. If the pellets are dried out, the hardened grease layers may form blocking the pores and as a result the efficacy of the device will fall sharply. Therefore, make sure to keep OilFresh device immersed in the oil around the clock, 24x7, whether in use or not.